Please note that TensileFabric is not a supplier of the fabrics detailed on this page. 'Tensile fabric is a process - it describes fabric under tension'. Central to our business are the fabrics. Essentially the options are endless. We use fabrics from around the world to ensure the fabric used for your canopy or structure is the most appropriate. But it is often the case, especially with interior fabric, that we are borrowing fabrics from different industries, using them because they suit a certain application or have a certain quality that is useful to us. To this end, some of our fabrics are only available in limited colours or fire ratings etc., but the following information should help you to understand a little more about these specialist fabrics. 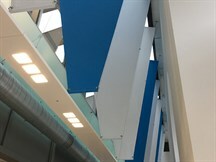 The required rating of the fabric will very often depend on the application, location and position. Therefore you should check with your fire office which fire rating is required for the specific item you are designing/installing. In the UK we are complying with the British Standard (BS), but as from April 2007 the Euro classification is now part of building regulations. The Euro classification is a new way of testing the fire rating of items, and in the fabric application it is more thorough than the existing BS tests, taking into account surface spread of flame but also smoke and droplets. The fire test is expensive, being a 6-part procedure, so some fabrics have not been tested to the new rating. Eventually though, all fabrics will be rated to the new system. We will continue to update this information as more manufacturers test their supplied materials. Not all fabrics are available in a colour range. As mentioned above, many of the fabrics we use come from other markets and are therefore often produced only in white or in a limited colour range. Other fabrics do come in a range of colours, and where possible we try to offer the widest range to our customers. Where this is not possible, or where graphics are required, we can print onto our fabrics using the latest UV ink for ink jet, or Dye Sublimation for strong permanent, non-scratch printed fabric. Many examples of printed works can be viewed in our bespoke exhibition portfolio. Tensile fabric is ideal for sun shading as it works both externally and internally. For exterior use, the sunshade will invariably also be waterproof, as although we do use meshes outside that will not provide waterproof qualities, most people choose a fabric that offers both options. The degree of shade and UV block that a fabric will offer will depend on a number of factors: its weight, its colour and of course its technical make up (as some fabrics are laminated with particular layers to prevent UV transmission). For further information on this speak to us about your project as often specific details of your requirements will point to the use of a particular fabric. For interior use, sun shading is often focused around protecting people from sunlight in glass roof/fronted spaces, like receptions and atriums. For these spaces we can use various types of mesh fabric, offering predictable light reflecting/diffusing qualities, again depending on weight, openness factor and colour. For exterior use, we generally always use waterproof fabrics, as the UK weather dictates that a client will want maximum protection from the elements. Fabrics we use offering this include the PVC coated polyester, the FX500 nylons as well as others depending on your requirement of feel and appearance. We do use some canvas fabrics, but often this is not suitable for permanent exterior canopies as it can stretch over time and become quite faded. 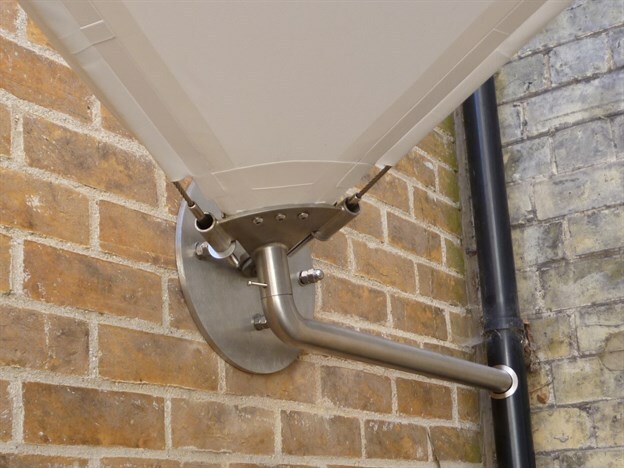 For water control, we can add fabric gutter up-stands into the fabric, as well as hoppers to collect the water, as part of the tensioning detail. For this job (see right) at a school in Cambridge, we integrated the gutter details to tie in with the existing drainage system. Fabric costs vary hugely depending on a number of factors, including base cloth type, quality (European fabric is a lot more expensive than Far Eastern fabric) and quantity (although this is not always relevant). We try to offer a very wide range of fabric to try and match our client's brief and budget as much as possible. Perhaps the most subjective of aspects, this will often ultimately influence the feel of a canopy. All fabrics have different visual qualities: the texture, translucency, shininess, etc., but personal preference will always come into play.